Optimizing working processes during order picking through software is a downright classical task of IT and practical data processing. Algorithms for solving problems by finding the shortest route need to be taught during every first IT semester and included in every good programming manual. But things get difficult in practice as even the best order picking software requires suitable hardware for unfolding its entire strength. As regards the simplest cases, this “hardware” still consists frequently of printed picking lists order pickers process while using ballpoint pens and blotting pads. But nowadays an intelligent combination of order picking software and hardware offers huge potentials for increasing efficiency and minimizing errors. Irrespectively of which hardware is utilized in connection with order picking software, software-aided solutions as such have a great many advantages over traditional paper-aided order picking. The aforementioned algorithmic solution to the problem of finding the shortest route is only one of many components here. For example, if order picking lists need to be suddenly changed (e.g., because damaged items need to be replaced by similar ones), the optimal walking route can be directly calculated anew. Processing the list can be directly coupled to other systems, like, e.g., for accounting, preparing delivery notes or re-ordering. Time-consuming extra work for order pickers can be minimized in a targeted manner or even avoided altogether due to this. Of course, software-aided order picking serves also the minimization or prevention of errors. Plausibility checks and inventory level queries avoid basic order picking mistakes at the highest level. Suitable input methods used after performing picks (like scanning or Pick-by-Light…) avoid blunders and inadvertent mistakes directly where they would otherwise have occurred. Coordinated systems also help to reduce tremendously the efforts that go together with training new order pickers on the job. The inherent documentation function of many software solutions for order picking needs to be eventually emphasized as well. These data backups or interfaces to other systems (for invoicing or triggering re-orders…), which are primarily used for enhancing productivity, are also the basis of every quality management process integrated into order picking processes and based on them, of course. Be they screenshots or sound recordings or just simple log files – the activities performed during order picking and their impacts can be documented and evaluated almost seamlessly by appropriate means. Thus, there are no more obstacles to well-functioning and efficient quality management. In practice, many of the aforementioned advantages of software-aided order picking won’t unfold their true strength without interactions with other factors. Therefore, the crux for integrating order picking software as best one can consists of the interconnection of as many functions as possible through adequate sensors. From our point of view, this is today solely possible by Pick-by-Vision solutions based on modern data glasses. p>The iVision®, our innovative software combines not just the advantages of software-aided order picking with data glasses but it also serves as a modular supplementation to already existing order picking solutions and it can be individualized as needed. In this way, shortcomings of the original system can be eliminated and functional defects can be fixed in a targeted manner. Thus, for example, extensions for new and enhanced walking routes optimization or connections to other systems are viable in practice without any difficulties. Now isolated solutions which have not been efficient so far can be integrated into the existing system landscape in an efficient manner through iVision®. 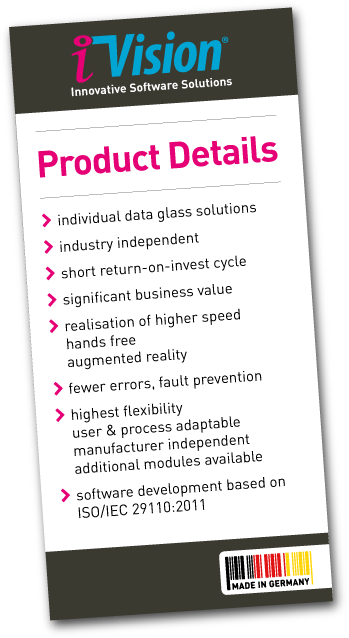 Therefore, we are one of the few providers on the market who can realize both complete new introductions and extension projects in your warehouse through one single and flexible platform for data glasses. We will show you how to quickly and sustainably generate added value with modern auxiliary means like Pick-by-Vision and specialized order picking software and how to reduce costs in the long run over this. iVision® is the patented solution of PeRoBa® Unternehmensberatung (Management Consultancy) GmbH for optimally enhancing manual order picking processes. iVision® was awarded the “Best of 2018” IT innovation prize. We are looking for pilot users. Make sure not to miss out on interesting advantages! Are you also looking for modern and efficient software for order picking or a supplementation to your old systems? Don’t hesitate to get in touch with us, then. We are glad to explain to you the advantages of Augmented Reality and Pick-by-Vision based on your specific tasks and needs.